I’ve been so busy with work as usual, I’ve hardly had chance to paint anything, or update this page. 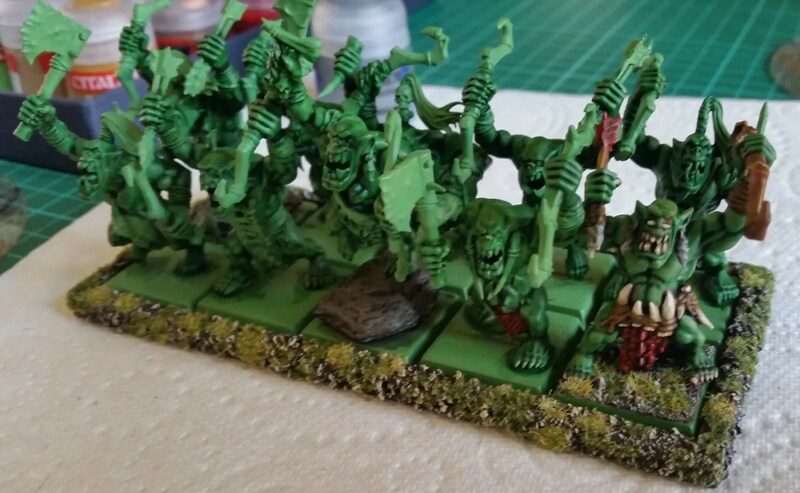 All I’ve managed recently are putting together 10 Savage Orcs as bowmen to use as Skulks for Kings of War. I painted one up to see how they looked and have based the rest ready and magnetised for their movement tray. 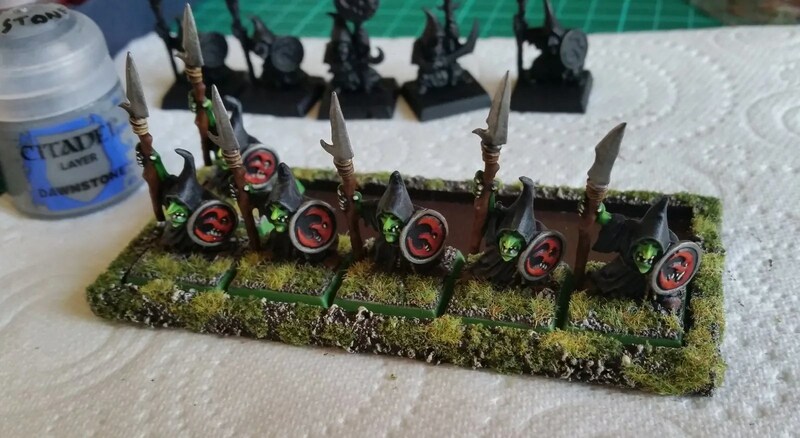 I also had a pile of Night Goblins I’d picked up off eBay to add to my existing unit (of Kings of War Sharpsticks) to make a horde of 40. The only problem was that these newer critters are way smaller than the older ones. Although they’re on a movement tray, it’s not got the other 29 painted figures with them. I’ve done these 6 of the newer ones this weekend. Hi, nice blog. I am just starting out with KoW and have a GW Orc and Ogre army (only played a few games in 8th). I too will use my savage orcs as skulks. I wasn’t sure of the model size for ‘skulks’ as they sound like having an orcling stature. Keep up the good work! I think KoW skulks are weasely/cowardly types. Doesn’t fuss me. Anything goes in KoW. Plus they’re the only affordable archer orcs that I could get off GW that looked similar to my others. I’m glad I got them, I expect with all the Age of Sigmar nonsense, GW will re-make orcs to look different or scale them even larger.